When looking for restaurant management software, there are many solutions available. It’s important you know what most important to you, at the phase you are at in your restaurant operations. The monthly fee, is the smallest investment you will make in the restaurant software. Your biggest investment will be time. If you don’t know your current food cost and decide that you are going to start by calculating every detail, in every recipe, you can spend hundreds of hours programing your new restaurant food cost software. When in reality, you might just need to know your total food cost which you can calculate with about 30 minutes of setup and about 5 minutes per day. Plus, different restaurant management software programs offer different tools. Some are great managing liquor cost, but weak on food cost. Others will have scheduling software in addition to their food cost modules. It’s important that you keep things as simple as possible, do your research, don’t over commit to something you won’t be able to understand in the future. After all running a profitable restaurant is the name of the game, if you are just spending your time working on software all day, you are ignoring the most important thing…OPERATING YOUR RESTAURANT. Is BACON a full Restaurant Accounting Software Program? No, BACON is a very simple, Food Cost, Labor Cost, Beverage Cost and Direct Operating Expense tool, designed to help bridge the gap between your POS system and your Accounting Program. Most POS systems lack the detail you need to get important data and most Accounting Programs (like Quickbooks) just won’t help you be proactive. They will get you SOME of the data you need to run a more profitable restaurant, but the data is old by the time you get it. BACON allows you to create a budget in just a couple minutes per month, then it will give you daily updates on your food cost, beverage cost, labor cost, prime cost and direct operating expenses in relationship to that budget. Using this UP-TO-DATE in formation, you can make changes mid-month rather than waiting till it is too late to find out that you missed your food cost again. Does BACON have a declining balance sheet? YES, that is one of the core functions in BACON. At any moment in time, you will be able to know exactly how much money you have spent on a specific category and how much more you can spend on that category to hit your budget. Armed with this data, you can free up your managers to take over more purchasing control, without fear of them over (or under) ordering. What if I don’t take inventory in my restaurant? 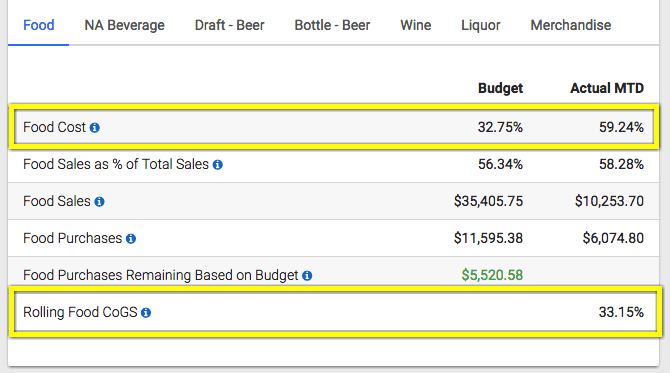 Inventory is a pain in the rear…while it’s a key component to calculating an perfect Cost of Good Sold (CoGS) for Food Cost, Beer Cost, Wine Cost, Liquor Cost, it also is only as good as the data. “Garbage in Garbage out.” If you are not updating your recipes and purchase prices per product, on a daily basis, your inventory values will be wrong. If your recipes are not perfect, your inventory values will be wrong. You could potentially be taking action, making change in your restaurant, with BAD information. In BACON we have created a special algorithm (that is patent pending) called Rolling CoGS. This has been tested against accounts that take inventory and it is VERY accurate, in some cases more accurate. Plus, there is NO need to take inventory, no need to update your prices on each product and no need for recipes on every single item. Why is the rolling Food Cost so different from the Food Cost? It’s because the Food Cost at 59.24% is actual month to date purchases divided by sales, while the rolling Food Cost is using our algorithm to take historical data into account. What happened here is that this restaurant received a large food delivery this morning, but has not sold any of that food yet. They only receive a breadline delivery once per week, so it will take almost an entire week to sell that food. 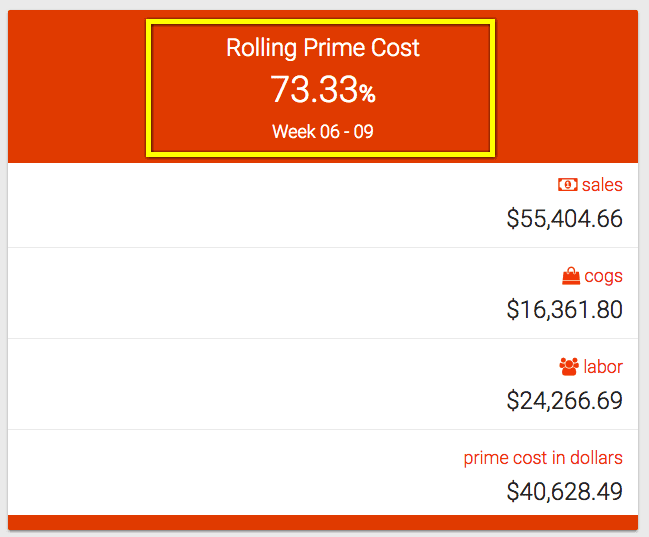 While the Rolling Food Cost is a long term indicator to that is more accurate to the actual number. Previously, you would have to wait till the end of the month to get this kind of information, but now with BACON accurate daily, actionable data to help you run a better restaurant is at your fingertips. What if we do take inventory, does BACON support that? YES, we also allow you to take weekly inventory or monthly. You can take weekly inventory on easy to count stuff like Beer, Wine and Liquor then monthly inventory on Food. Can I Access BACON from any computer, what about Mac and Mobile? YES, any device with an internet connection. We are 100% cloud based and accessible via all web browsers no matter if it’s a PC or MAC. BACON also works on all mobile devices. YES, there are a couple ways you can get under the hood of BACON. 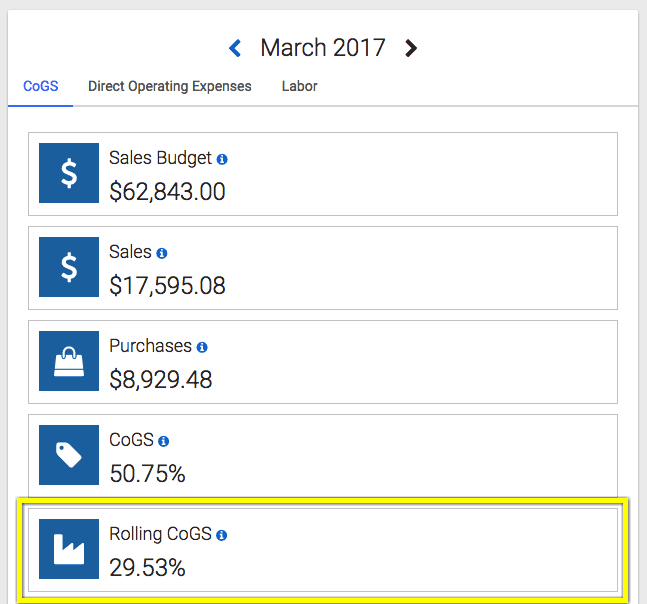 If you want to literally go inside the software right now, you can click here and see sample cost data, as well as build Checklist, Prepsheets, Order Guides, Inventory Sheets, Kitchen Build Sheets that you can use in your restaurant and save to a free account. No credit card, nothing! If you want to attend a training and demo where I will explain all the features and benefits plus teach you how to use a budget that will save your thousands of dollars a month and 3 simple ways to increase your sales by up to 13.9% this week, then find a date and time for our live training.